This is the time of year known as the ‘hungry gap’ (at least here in the UK). It’s spring – seeds are germinating and seedlings are growing, but there are precious few crops ready for harvest. My kale has started flowering – the pollinators like it, but it’s not much use for me to eat now – the purple sprouting broccoli is battling on and providing one fresh vegetable from the garden, but the current star is the rhubarb. Rhubarb is really a vegetable, but we treat it like a fruit. It’s great stewed with a little water and some sugar and served with natural yoghurt or vanilla ice cream. Even better with the addition of waffles and maple syrup. Some people mix it with orange when cooking, but my favourite combination is rhubarb and strawberry. It’s not strawberry season here yet, but they will soon be available from Pembrokeshire (not too far down the road) and after that we should have them from the garden too (if the chickens don’t get to them first!). And then we will be having rhubarb and strawberry sponge – delicious and made with eggs from Esme and Lorna (sadly not Gytha for a while – we have to discard any eggs she lays for quite a few weeks after she’s finished her antibiotics). 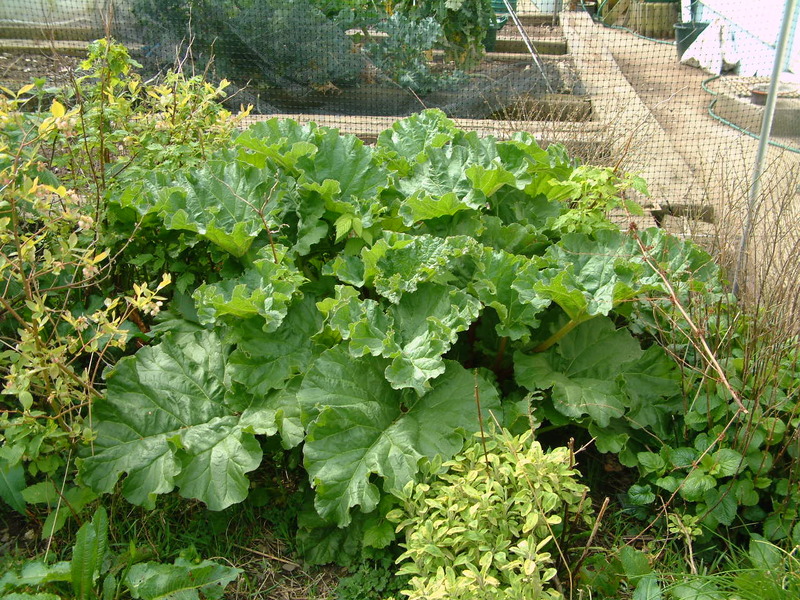 As well as providing lovely fresh food early in the season, rhubarb just keeps on giving – it likes a good application of compost each year or two and benefits from watering through the summer, but as long as you keep picking it, it keeps growing. Some years it decides to flower, and if you allow it to do so, you get statuesque flower heads, but precious little to eat because all its energy goes to the flowers. However, if you cut the flower stalks back as you notice them, you will have your harvest. If you have a dehydrator, rhubarb makes pretty good fruit leather. This works well mixed with strawberries too. Just stew it until it’s soft, sweeten to taste, then spread it out on fruit leather trays. If you don’t have the special trays, the pre-perforated ‘microwave’ plastic wrap works okay too, but is sometimes difficult to remove completely. It’s maybe a little strong tasting to eat this leather directly, unless you mix it with other fruits, but you can use it for cooking and baking. Sounds great – I will certainly have a go. I’ve also found a recipe for ‘Poached Rhubarb with Orange and Ginger Wine’ that I’m going to try and report back on.